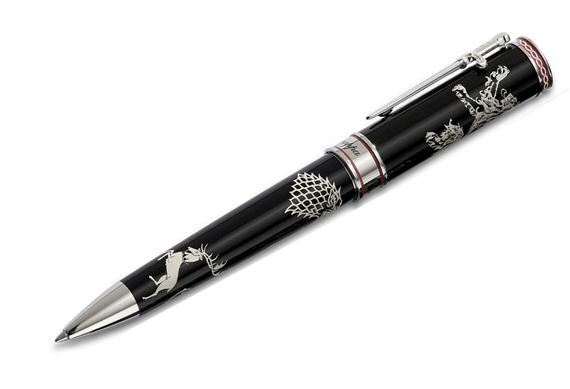 Order your Montegrappa Game of Thrones Westeros Ballpoint Pen today from FahrneysPens.com. Fine Pens, Refills & Luxurious Gifts – great prices & fast shipping. To follow up its hugely successful collection celebrating the noble houses of George R. R. Martin’s fantasy, Game of Thrones, Montegrappa proudly presents the new Westeros series, representing the continent of the Seven Kingdoms. With its epic storylines of family and honor, ambition and love, and death and survival, Game of Thrones has captured the imagination of fans everywhere. The Westeros series features sigils and emblems representing the key families: the Stark direwolf, Baratheon stag, Lannister lion and the Targaryen dragon. The pens are crafted in rich black lacquer with palladium accents including the cap rings with dark red enamel trim and the perfectly-cast sword clip. The Westeros fountain pen holds a nib forged in stainless steel. You can also wield a twist ball pen or capped rollerball. Each piece comes in a special Game of Thrones box.